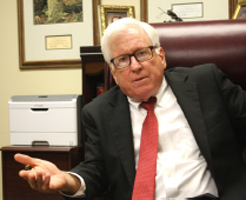 Mississippi Supreme Court Chief Justice Bill Waller Jr. has called upon chancellors and bar associations statewide to organize free family law clinics to assist poor people. Plans are underway to hold free family law clinics in every county later this year. The Rankin County Chancery Court and the Rankin County Bar Association organized the free clinic in anticipation of conducting a larger clinic later this year in conjunction with the statewide pro se effort. “It is vitally important for all citizens to have access to the courthouse. 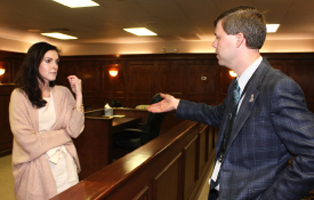 Mississippi has one of the highest rates of poverty in the United States and these legal clinics allow meaningful access with the assistance of volunteer lawyers,” Chief Justice Waller said. “There is a huge need. 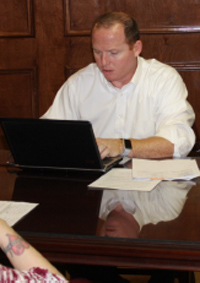 We are in a unique position to help people,” said attorney Joshua Coe of Brandon. Coe helped a couple file for a divorce during the clinic. For four hours during the Jan. 26 clinic, volunteer attorneys met with clients at the Rankin County Courthouse in Brandon. Clients who had been screened for low income eligibility were scheduled at one-hour intervals. The attorneys answered questions, drafted documents, corrected documents that the people had prepared by themselves and, in a few cases, presented the cases to three waiting judges for signatures. 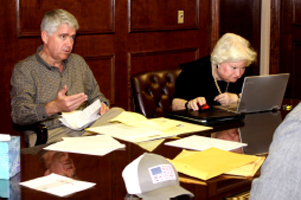 Chancellors John S. Grant III, John C. McLaurin Jr. and Haydn J. Roberts were available to sign completed cases. Most of the cases were uncontested divorces. The most unusual was a guardianship case. The young woman who came looking for guardianship assistance said that she had taken in a friend’s infant son in Michigan after he was born in October. She told an attorney that the birth mother had been raped and was unable to care for the child. She said that her friend asked her to take the child and raise him as her own. She brought the child back to Mississippi. Attorney Bridget Todd, who met the young woman for the first time at the Pro Se Day, accepted her as a client and began work to gain a legal guardianship for the child. “It’s a precarious legal situation for someone to be in to have physical custody of a child but have no legal right to the child,” Todd said. Without a court-approved guardianship, the woman has no legal right to make medical decisions for the baby if he gets sick, enroll him in daycare, or later on enroll him in school. 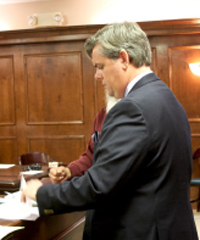 Jeremy McNinch, an attorney and adjunct professor at Mississippi College School of Law, interviewed his client by phone in advance, prepared documents for an irreconcilable differences divorce and brought the paperwork for him to sign at the courthouse. “He had tried to do it himself. He didn’t know how to do the rest of it,” McNinch said as he waited for the man to review the documents. “A lot of our citizens in Rankin County do need legal assistance with their matters and they can’t always afford a lawyer,” McNinch said. Income determined participants’ eligibility for assistance at the free clinic. The threshold is an annual income not exceeding 200 percent of federal poverty guidelines, which is $31,860 for a family of two, $40,180 for a family of three or $48,500 for a family of four. Chancery Court Staff Attorney Steve Edwards screened applicants to make sure they were eligible to receive the free help. Many of the people seeking assistance had already filed court documents on their own, known as pro se, but their documents were improper, incomplete or incorrect. Pro se litigants sometimes have to return to court multiple times as they try to correctly draft court papers. “Self-represented litigants often struggle to meet all of the requirements for properly drafted legal documents. Hearings are frequently delayed or rescheduled because self-represented litigants are unable to comply with the strict requirements of the rules of procedure and applicable statutory laws,” Edwards said. “If they had just a little guidance, it would work out for them,” Coe said. Attorney Connie Jones of Brandon worked with Edwards to organize the clinic. She views it as giving back.